This past month has been an eventful one, we just got back from our honeymoon in Maui a little over a week ago and Vancouver is only now starting to feel normal again. Being in Maui was super magical and amazing, I haven’t ever felt that consistently and deeply relaxed that I can remember as an adult or even as a teenager. I ate lots of barbecued fish tacos and fresh pineapple and began each evening on our balcony watching the sun set in our robes with an ice cold gin and tonic. I’m trying to sustain this elusive feeling of refreshed relaxation by being mindful of my penchant for worrying over events both past and future, basically the events that are entirely out of my hands in the present moment. So far this has been helpful, maintained by good sleeps, lots of outdoor exercise, and nutritionally dense and diverse foods. This kale and chicken noodle soup was what got me through a rough bout with H1N1 in mid-January, I have since made it several times during stints of pervasive rain and darkness and I especially appreciate it after blustery wet nighttime run. 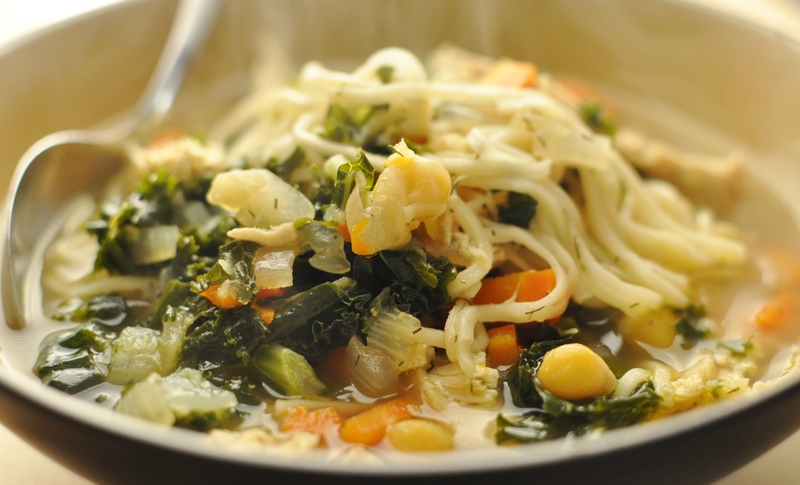 Besides some light chopping this soup comes together quite quickly and I recommend eating it as soon as the noodles are cooked through, it will reheat but definitely tastes best eaten immediately. You could easily change the vegetables used in this version, add tinned diced tomatoes with their juices, use finely cut Napa cabbage or bok choy instead of the kale, and a fried egg perched on top of the noodles with some Sriracha sauce will only be doing you a delicious favour. 1. In a large soup pot bring the chicken stock to a steady simmer before adding the onions, garlic, chicken pieces, carrot, celery, dill weed, kosher salt and red chili flakes to the hot stock. Allow to cook in the simmering liquid for 8 minutes, stirring occasionally. 2. Add the instant noodles and chopped kale, cover and simmer for 3 more minutes or until the kale is cooked through. 3. Stir in the chick peas and lemon juice before testing for seasoning, adding more salt or chili flakes if desired. Serve as hot as possible to soothe cold and flu symptoms or to warm up after being out in the cold. It’s been a lot of nights listening to The House of Love lately, this easily being one of my favourite songs ever. Its nostalgia for the relationship between the listener and the song captures my time alone with music and food perfectly, the quiet concentration in the kitchen with a cup of tea or a glass of wine while providing nourishment for myself and those I love is one I hold dearly.